We volunteer once a month by cooking and serving a meal with Wesley UMC. 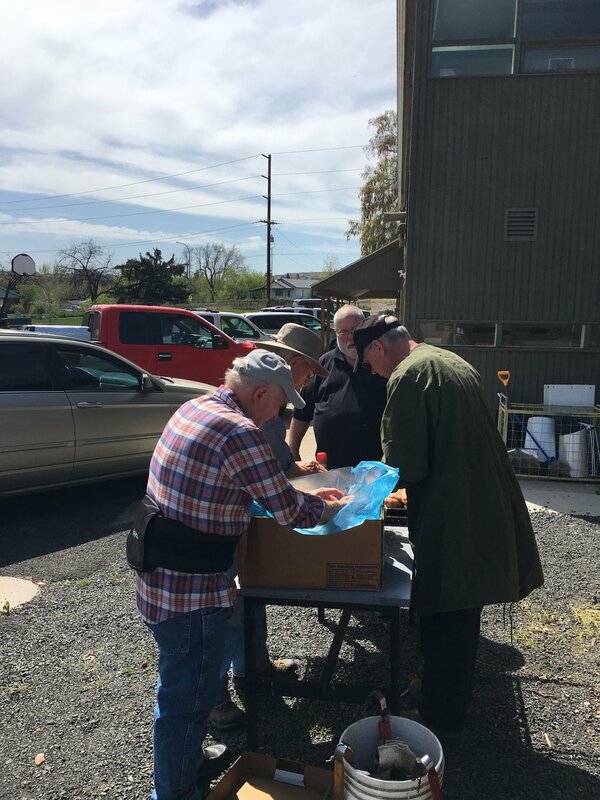 Preparing and serving chicken for Camp Hope, April 2018. Camp Hope began in March 2017 in response to critical need expressed by city and county officials to alleviate the challenges of homelessness in downtown Yakima and the greater Yakima Valley. Our city had been experiencing a marked increase in individuals experiencing homelessness and an unsupervised tent encampment had cropped up downtown in an abandoned lot near homes and local businesses. The city and county needed help addressing this issue and the Yakima Valley Council of Governments (YVCOG) awarded a grant to Transform Yakima Together to get Camp Hope started. On March 22, 2017, Camp Hope began as an outdoor, barracks-style encampment for approximately 45 adults with 24-hour security, 3 meals a day brought in by volunteers, a shower trailer (as there was no running water), and an education center to teach life skills, literacy, and GED classes. As the temperature got colder, a search began for an indoor location. On November 15, 2017, the Camp Hope winter weather shelter opened in a warehouse on 1702 Englewood Avenue in Yakima. The location operates as a day-time warming station for many homeless in the community and sleeps around 100 residents nightly, not only for men and women, but now for families with children as well. In 2017, Camp Hope provided 15,388 bed nights and 33,853 meals to 556 unique individuals. To learn more about Camp Hope, click the image above to be directed to their website.